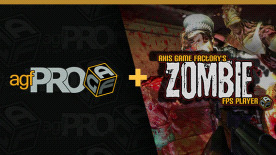 Zombie FPS Player is a new DLC for Axis Game Factory’s AGFPRO and PREMIUM that allows users the ability to create their own 3D Zombie Shooter games from a first-person shooter perspective. Packed with tons of assets, features and game player mechanics, users are able to create endless custom Zombie themed games that include: five custom enemy types of characters each with unique abilities and animations, a wide variety of weapons, health and other pick-ups, assets tuned with game-play mechanics, environment assets for interior and exterior map creation, explosive assets, scene-linking for endless map connections, FPS game play, sounds, sound effects, and custom placement for all enemy characters, start and end points. Get ready for some serious fun and immediate satisfaction creating your own Zombie FPS games to play AND share with your friends!! Player Pick-Ups – weapons, ammo, health, etc. Additional characters, assets and gameplay features will be released in future DLC packs! Axis Game Factory is required to play this DLC.